. : Eva Szabo :: Ski XCOttawa.ca :: Skiing in Ottawa and Gatineau Park :. Eva is a fourth year engineering student and has been racing with Carleton University for her school career. Eva is a prime example of how dedication and motivation to a sport can really help to achieve success. 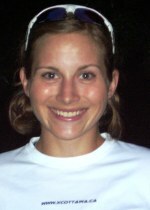 Over the four years while she has been skiing for Carleton she has made astonishing improvements leading to results such as a sliver medal in the skate race at the OUA Championships, being a member of the gold medal relay team in the 2004 CCUNC (Canadian University) National Championships, and a member of the 2003 CCUNC national championship team. Outside the wonderful world of nordic skiing, Eva has this unlimited amount of energy that allows her to dance the night away, or dance at any excuse she gets! She also has an impeccable sense of fashion and an ability to match earrings with every outfit she wears. Watch out ladies, her silent but strong personality is nothing to reckon with, she may be quiet off the trails, but she's one tough cookie!